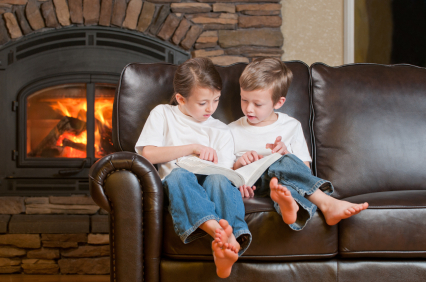 Is your Gas Fireplace kid friendly? As part of National Fire Prevention Week, the fireplace industry is reminding homeowners that have a glass fronted gas fireplace that the glass can get very hot when the fireplace is on or even when cooling down and precautions should be taken. If a family has young children, or visiting grandchildren, there are safety measures that should be taken to prevent burns from touching the glass. Fireplace Safety Gates: Like a baby gate, a fireplace gate around the fireplace will prevent young children from getting near the fireplace. Fireplace Screen: Similar to a screen in front of a wood-burning fireplace to prevent sparks, a fireplace screen in front of the glass of a gas fireplace will prevent little hands from touching the glass. Homeowners are also reminded to always supervise children when a fireplace is burning – whether it is a gas, wood-burning or pellet-burning fireplace or stove. If the gas fireplace has a remote control, be sure to put it in a place where children can’t reach for it and, for extra precaution, put a screen or barrier around the fireplace.